But I want to get in shape! 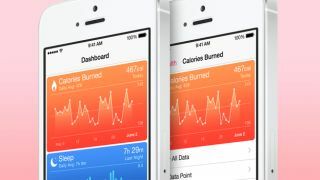 Wednesday may have marked the grand arrival of iOS 8, but the launch was marred by a bug keeping health and fitness apps that use Apple's new HealthKit platform from landing. Apple didn't say what the problem was exactly, but it admitted a bug is delaying these apps from arriving on iDevices running the new OS. The company hopes to resolve the unspecified issue by the end of the month. "We discovered a bug that prevents us from making HealthKit apps available on iOS 8 today," Apple spokesperson Trudy Muller said in a statement to Re/code. "We're working quickly to have the bug fixed in a software update and have HealthKit apps available by the end of the month." Part of HealthKit's appeal is that the platform stores pertinent health and fitness data in one central place that can be tapped by various sources, such as a running app or a doctor at a hospital. Packed with new sensors, the iPhone 6 and iPhone 6 Plus are meant to track body metrics in ways never before seen on an Apple product. That is, when iOS 8's HealthKit is working properly. It seems all apps using HealthKit have been pulled from the App Store or never made it there, and some have come forward to speak their peace. The developer of Carrot Fit, a weight-tracking app, told Cult of Mac Apple informed him the app was pulled from the App Store because of a "last-minute problem with HealthKit," as the site put it. Apple couldn't explain what the issue was, but the developer said users who downloaded iOS 8 had no problem with HealthKit. Others, like an updated WebMD app, were also pulled while Lark and Strava were made unavailable. It's expected that when a new OS launches, there's going to be some glitches. But for such a highly touted feature as HealthKit to run into a problem like this at launch, and to likely rub many third-party partners the wrong way in doing so, isn't a good way to get iOS 8 off the ground.